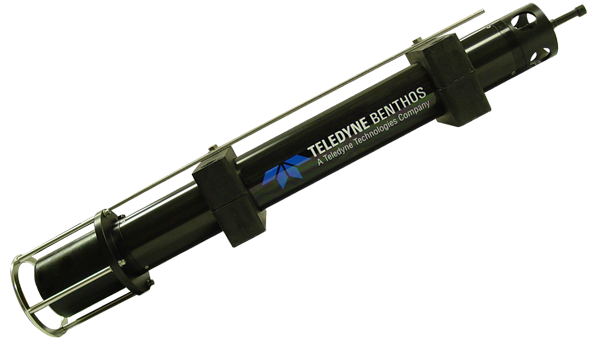 Benthos DAT is an extension to the Teledyne Benthos ATM-900 Series modem, which automatically estimates the azimuthal and vertical arrival angles of a message sent by a remote modem. The system is a “modified’ ultra-short baseline (USBL) which uses a broadband component of a typical modem message to form estimates of arrival angle(s). While conventional USBL devices employ tonal signals, our appropriate processing of wide band signals provides far better combined range and arrival angle estimation, especially at low Signal to Noise Ratio (SNR). DAT offers a clear 360 degree field of view in azimuth, and an approximate vertical coverage spanning + 90º overhead to -50º below horizontal. DAT’s compact size and low power consumption make it optimal for both surface and subsurface platforms. Acoustic modem and USBL functionality can now be integrated on Autonomous Underwater Vehicles in one system. Mounting our DAT on an AUV, as an inverted USBL system, can provide navigational accuracy unsurpassed by other systems.